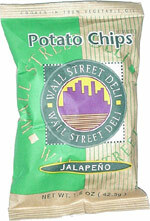 Taste test: These are good kettle-cooked potato chips with a nice and mildly hot jalapeño flavor. The kick is not very strong at first, but it does grow somewhat stronger in the aftertaste. As for jalapeño heat levels, these aren't anywhere near the same league as Tim's jalapeño chips, but the flavor is still a nice one. Smell test: Medium-strength jalapeño aroma. Not bad.